Every shoebox needs a $9 donation to provide for collecting, processing, shipping, and other project costs. If you make this donation online, you can Follow Your Box and receive a tracking label. 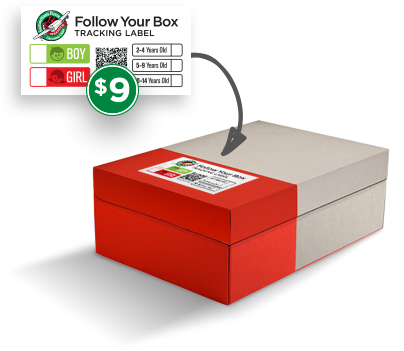 Attach the label to your shoebox, and use our Look-Up Tool to find out the country where your box will be delivered with the message of Christ’s love. As you checkout, print your unique label or save it to your computer. A receipt with your label will also be sent to your email address. Take care not to cover the barcode with tape or damage it in any way as this can affect scanning. If your label is ripped or separated from the shoebox in the packing process, it may prevent us from tracking your gift. The email receipt containing your label also will provide a link to our Follow Your Box Look-Up Tool.